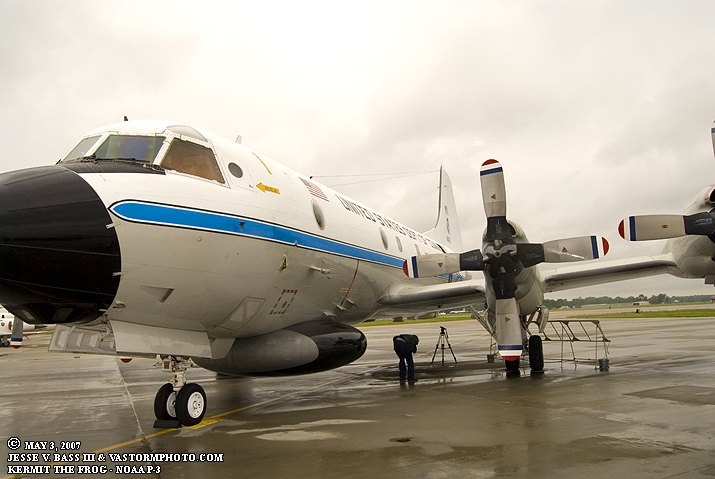 Every year in recent history, NOAA and several forecasters from the National Hurricane Center go on a tour of the Caribbean, Mexico and the United States with the NOAA Hurricane Hunter aircraft. The tour changes each year in the U.S. where one year they travel the Gulf coast and the next year they will be along the east coast. This year the plane and crew traveled the east coast of the U.S. making a stop nearby in Elizabeth City, North Carolina at the Coast Guard base. Thursday, May 3rd was the day and it was free and open to the public. This tour is to help promote hurricane awareness and preparedness each season. 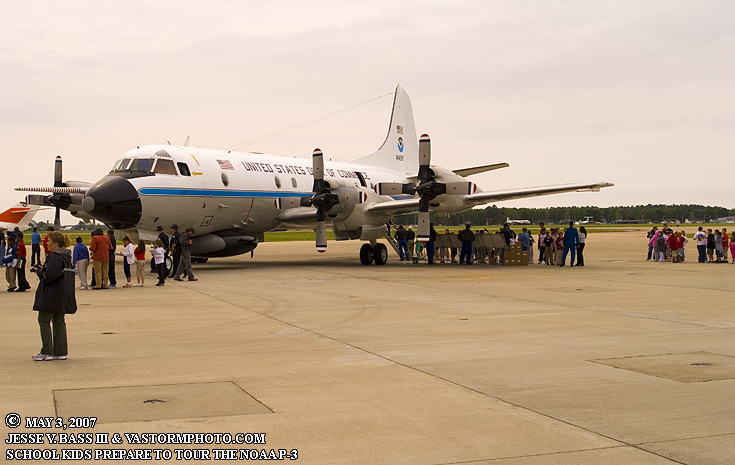 Many schools bring the children by to tour the plane as well as the general public. 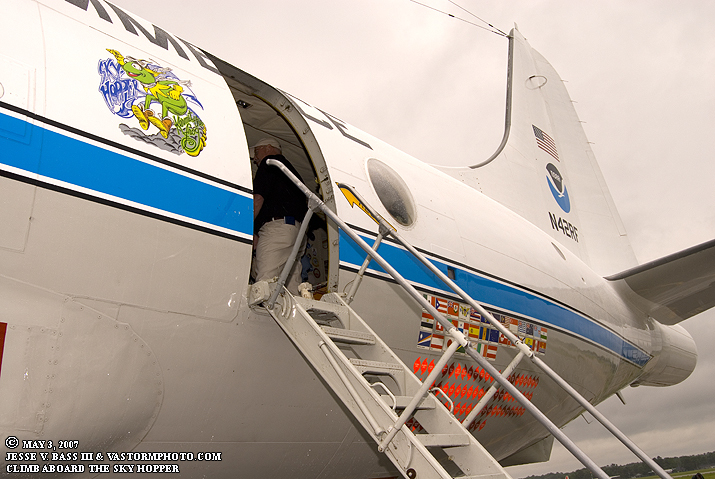 I was there and went aboard the NOAA P-3 named Kermit The Frog. 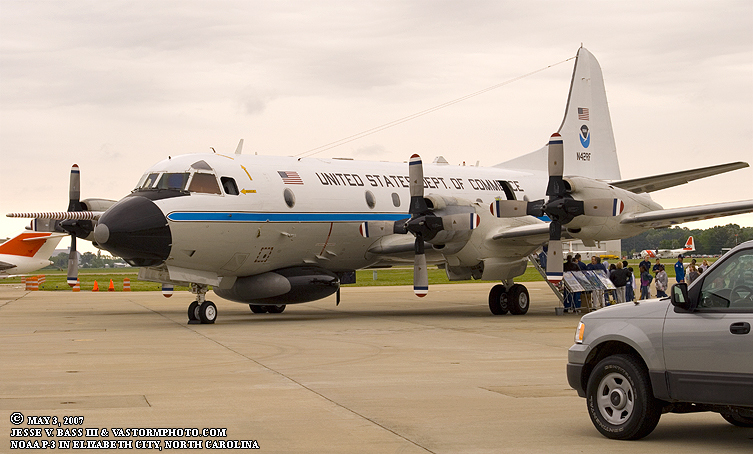 The other P-3 that was not here was Miss Piggy and the NOAA Gulfstream IV high altitude jet is named Gonzo. The day was cloudy and very chilly with temps in the low 60's and a stiff breeze blowing with gusts in the 20mph range. But that did not seem to stop the folks from coming out. It started to rain late in the day and drove most folks away and I was able to get on board early and take some shots. What an awesome set up they have with all the work stations and computers to monitor the storm on radar, tracking data, and of course the data that comes in from the drop windsonde. 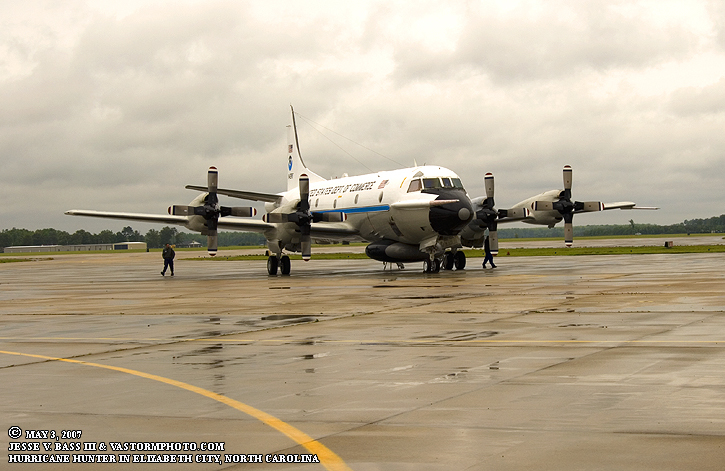 It would be great to be able to fly on one of these missions to investigate the next big hurricane threat. Maybe one of these days we will get that chance. Early in the day school children take a tour of Kermit The Frog. This shot shows all the hurricane missions this plane has made over the years. Every time they make an eyewall penetration they add another hurricane symbol with the name of that storm. Just in front of the rear door is the name and logo, Kermit The Frog- Sky Hooper! From the front of the plane you can see the radar dome in the gray and black housing just behind the nose and underneath the aircraft. Kermit sits on the tarmac in the rain. 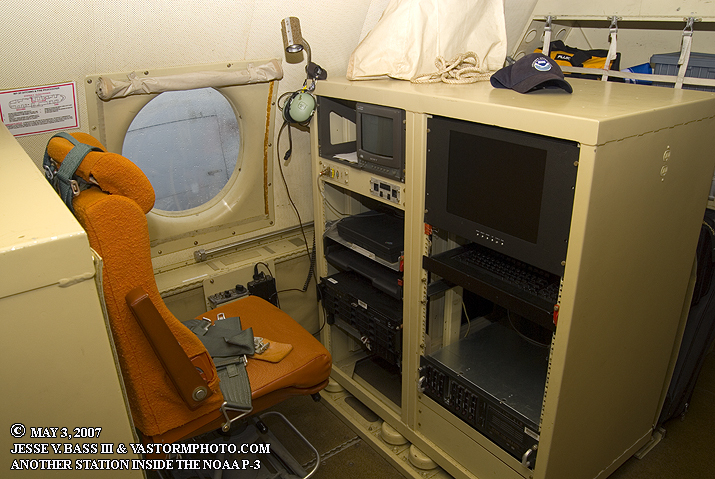 One of the monitoring stations onboard the P-3. You can see the headsets where everyone can communicate while on the mission. Another one of the computer monitoring stations. As you can see all the seats come with a five point harness to strap into as eyewall penetrations can be extremely rough and turbulent. 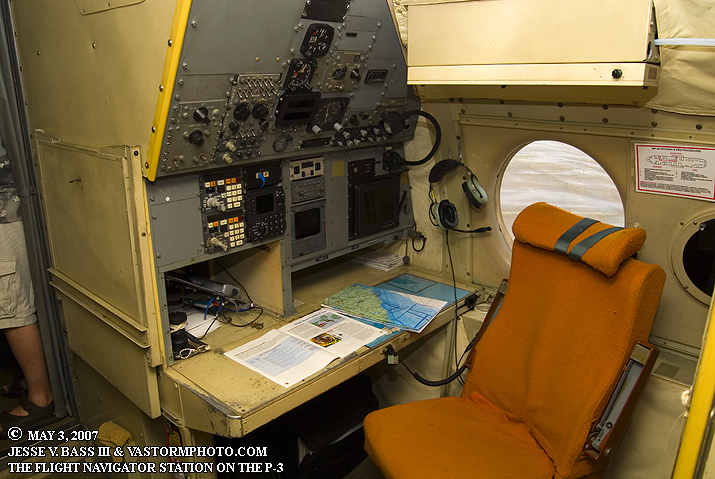 This is the navigator's station just behind the cockpit. This is where the navigator will direct the pilots on where they are in relation to the storm and the center and plot out the path through storm on the many penetrations on each storm. This is the Flight Director's station just behind the cockpit as well. This is the station where it is done. 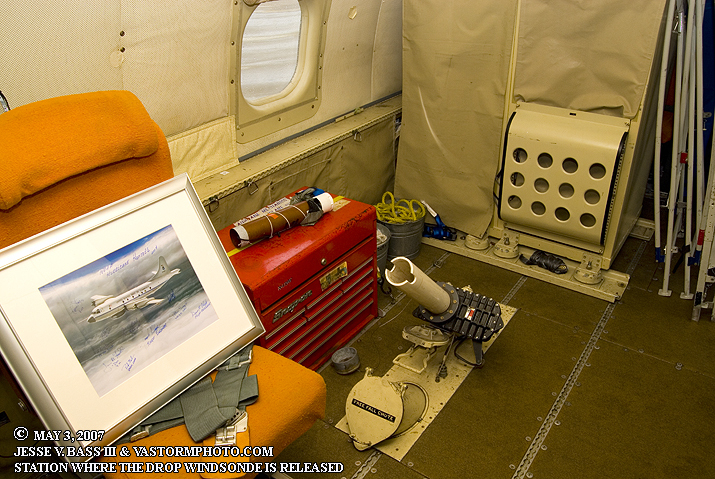 That tube is where the drop windsonde is released near the rear of the plane and into the storm. The brown tube on the tool box is the instrument. It has a parachute that lets it glide to the ocean surface, as well as instruments inside for wind data, temp, pressure, dewpoints as well as GPS to track it on its way to the ocean surface. And as you can see, this is the cockpit of Kermit. So many instruments and gages to watch. 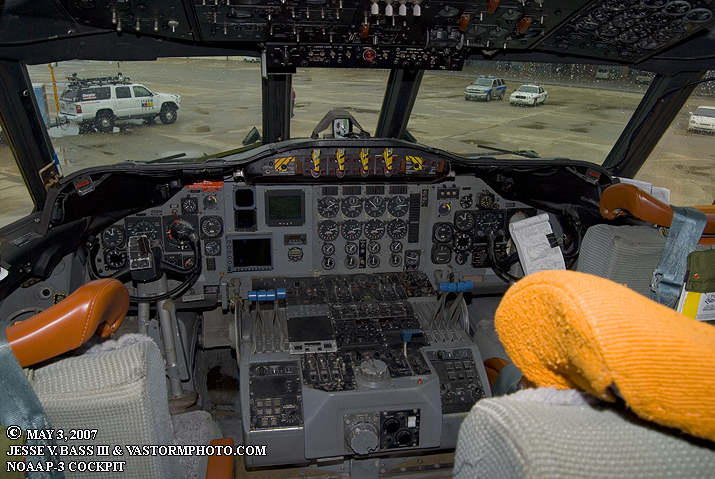 There are four seats in this cockpit and I am sure that the person in each is watching and monitoring certain instruments and gages throughout the flight. 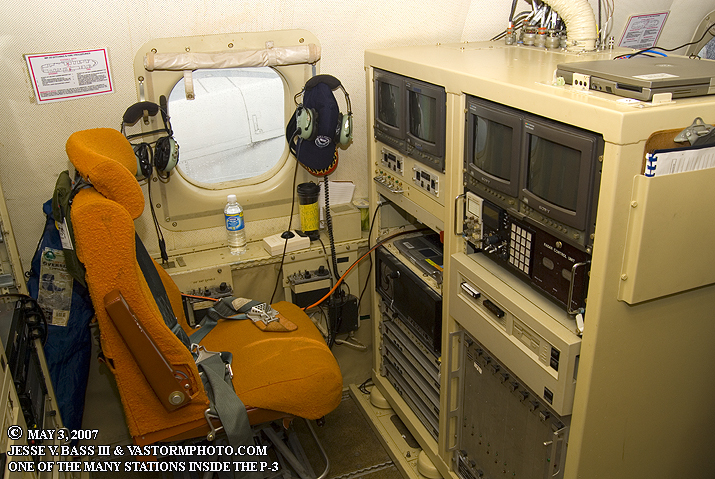 It was awesome to finally see inside at all the equipment that it takes to carryout one of these hurricane missions. And we did not see everything that they carry either. 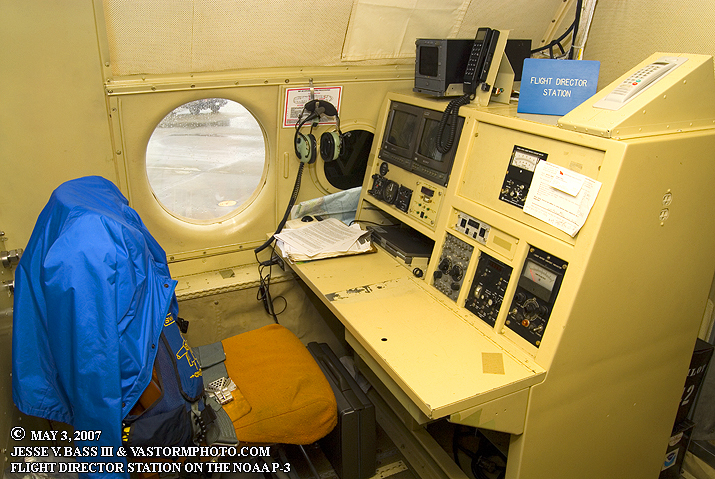 NOAA may also conduct specific hurricane related research most times when out in a storm, not just taking the pulse of the storm. So that's even more instrumentation, computers and a variety of other equipment that they may need to conduct their missions. 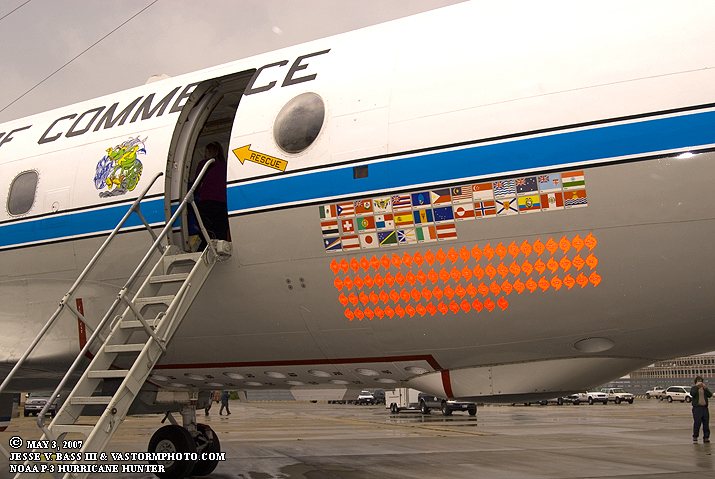 Some of these hurricane missions can last as long as twelve hours in flight. That does include the flight out to the storm and back. That's a long time to be in the air over the ocean in horrible conditions, but if it were not for what they do, we might be able to have the great data and information about each storm that threatens the western Atlantic. A lot of the data collected on these missions gets ingested by the global computer models which helps out in forecasting when, where and just maybe how strong they may get. These missions help you know what to expect and how to prepare for that big hurricane when it threatens your home town. They do a great job each year and they don't nearly get the recognition they deserve for taking on such a dangerous task. Our team would like to thank these teams on each of these aircraft as well as the Air Force Reserve Hurricane Hunters for their hard work, time and dedication they all put in.